FTC : I bought the vouchers with my own money and the opinions I stated are my own. I'm not paid in any way to say nice things about this company. Also, I am not affiliated with them. A few weeks ago, I was browsing online to look for discounted restaurant vouchers. I browsed through disdus.com and found a deal on doughnuts, specifically Krispy Kreme. It has been ages since I last ate a doughnut from them, so I investigated the voucher for further information. 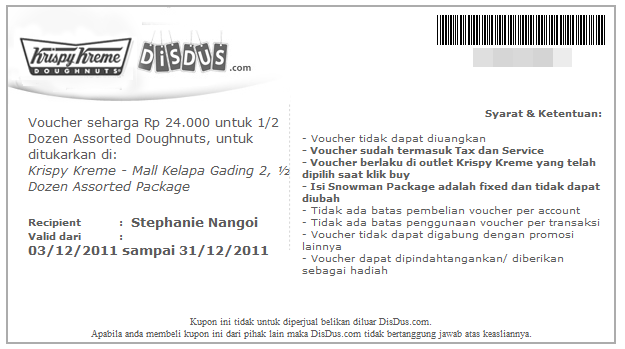 The deal was [50% Off] Snowman Doughnut Package from Krispy Kreme. Get 1/2 Dozen Assorted Doughnut (Original Glazed + Snowman + Snowflake) for Only Rp 24.000,- Nett. I figured I'll just try the doughnuts because they are shaped like cute snowmen and a snowflake, so I went ahead, purchased it, paid it, wait for the confirmation email to receive the voucher in my disdus inbox. A few days (I think it was 2 days, max), I received a confirmation email that I can already print the voucher. So, I did and took it to the Krispy Kreme outlet. Eh,tp di krispy kreme yg terkenal selain donut glazenya apalagi ya?dulu pas beli nyobainnya cuma yg glaze. Semoga krispy kreme segera buka cabang dimana2 ky j.co..
Lovely Cosme, aq suka yang ada cokelat ama kacangnya, tapi aq lupa namanya apa.. hahahaha... di dkt kamu blm ada kah cabangnya?